Ghiradelli is the famous confectionary that was started in San Francisco in 1849 by Domenico Ghiradelli. While the chocolates themselves are a sweet souvenir from the West Coast city, digging into a Ghiradelli sundae is an experience, much like Beard Papa cream puffs (we tried of of these too). 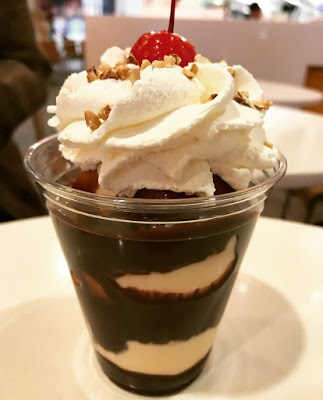 We found ourselves in the food court in the basement of Nordstrom in downtown San Francisco and my cousin suggested a dessert -- Ghiradelli classic hot fudge sundae. Originally she was going to buy one for each of us, but I managed to persuade her to just get one for five of us to share. It came in a large plastic cup, filled with vanilla ice cream, that were smothered in a hot fudge sauce. The dessert was then topped with whipped cream, Marashino cherry, and chopped almonds. WHOA. At first we were unsure what to think of this cup of sweetness, but once we dipped our spoons in there and tried it, the sundae was so good! Wish there were a bit more chopped almonds though.